ValleyAire Respiratory Services is now consulting services provided through Valley Inspired Products (VIP). Information collected from VIP testing will be shared via consulting, similar to the ValleyAire services, on the application and use of testing data. ValleyAire’s website and phone have been directed to this site and the principals of ValleyAire can be reached here. Power Options Pneumatic devices operate from the gas pressure in the supply system. These systems do not need an outside power source, therefore no power source needs to be checked or changed. Electronic conserving devices, however, are battery operated and need to have the batteries changed as needed for continued operation. An advantage of using an electronic OCD is that it is able to provide a light to indicate that the device is operating normally. Be aware that an electronic light may flash, signifying the device acted on the breath signal, even if no oxygen is delivered. Additionally, the device may sound an alarm or change if the device does not sense a breath or cycle to oxygen delivery. Portable oxygen concentrators require use of a power source to operate. All POCs use a rechargeable battery pack for portable operation. These devices also usually come equipped with a power pack that is able to be plugged into a wall outlet, which serves as both the power to the unit and the source for recharging the battery pack. Additional power source accessories are usually available, including car lighter adaptors. Cannula: Single Lumen vs. Dual Lumen; Nasal Prong Style Most pneumatic conserving devices require use of a dual lumen cannula—one lumen to sense the breath and the other lumen to deliver the oxygen. Some pneumatic devices use a single lumen and thus have a unique way of ending oxygen delivery. Electronic devices only need a single lumen cannula since a circuit times the end of the delivery. The size and shape of the cannula nasal prongs is also an issue to be aware of when using OCDs. Some cannula feature flared tips, some straight tips, and others tapered tips. These design differences can alter the resistance to flow inside the cannula, which can affect the amount of oxygen being delivered to the patient. Pediatric or low flow cannulas are not recommended for most conserving devices as the resistance to flow can impact the triggering of the device and can cause the conserver to auto cycle. Note that dual lumen cannula cannot be used with transtracheal oxygen delivery. Cylinder Operating Pressure OCDs utilizing oxygen cylinders are usually rated for a specific cylinder operating pressure, often from 500psi to 2000psi. It is important that the OCD be switched to a compatible tank when the current tank pressure is outside of the specified pressure range for operation. Also, many conserving regulators’ delivery volumes change with a change in tank pressure. Some devices will deliver slightly lower dose volumes at 500psi than they will at 2000psi. These volumes are usually not significant, but should be noted. Devices with continuous flow capability will usually see delivered flow rates drop as the cylinder pressure drops. Ease of Use Extra features and benefits are often not utilized by patients using conserving devices. Adding clinical features are only an advantage if the patient’s clinician sets the device up and knows how and why a special feature is a benefit to the patient. The “keep it simple” philosophy is an advantage for patients and helps keep confusion using a device to a minimum. That said, there have been a few devices that have been released recently that have additional product features unique to that device. Testing Operation of a Conserving Device Since conserving devices have entered the market, it has been difficult for users questioning whether or not their device is operating correctly to see if that is indeed the case. Since conserving devices deliver a volume of gas as opposed to the “gold standard” of continuous flow oxygen, you cannot use a liter meter—the device used to spot check flow on a CFO system—to test OCD operation. A device called a Pulsemeter is available to test pulse type conserving devices. 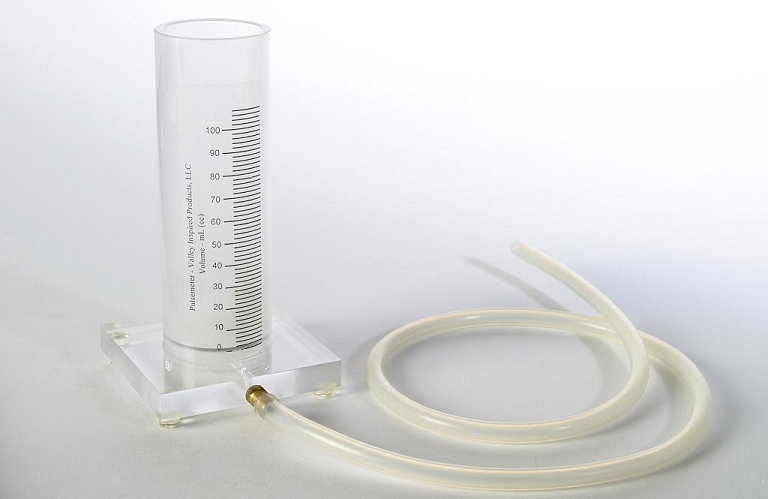 This unit is a volume-measuring device, and is used by connecting the OCD to the device and triggering oxygen delivery. The user is able to quickly spot check the amount of oxygen being delivered to the meter. Each OCD manufacturer should provide the volume of gas delivered per setting, so if the volume is incorrect, the device can be returned for repair. If the device appears to be delivering its O2 dose correctly, other reasons for the perception of an OCD malfunction would need to be investigated. Note that a pulse volume meter cannot be used to test a demand system. Movement: The device senses movement and changes the oxygen dose to a higher setting. When movement stops the OCD then switches back to the lower dose setting. There is already approved product featuring the ability to change dose setting as a result of device movement currently on the market. Oximetery: The OCD device monitors the patient’s oxygen saturation. An algorithm in the device changes the oxygen dose based on oxygen saturation. There is an FDA cleared product with this feature, but it is not currently on the market. Respiratory Rate: The device monitors the patient’s respiratory rate and has an algorithm that switches the dose setting to a higher dose with a higher respiratory rate. There are no currently approved devices with this feature on the market. Other Application Issues OCDs should never be used with in-line humidifiers as the OCD will not be properly triggered. Long delivery tubing will slow the gas delivery and may affect device sensitivity. Refer to individual manufacturer recommendations before using nonstandard lengths of tubing, and always test the patient’s saturation when using longer delivery tubing. OCDs should not be used with masks as the OCD will not sense an inspiratory signal and there is no oxygen delivery during exhalation to flush the dead space volume. OCDs should not be used to bleed oxygen to a CPAP or Bi-Level device as the OCD will not properly trigger and oxygen flow/volume will not be adequate to change FIO2. Copyright © 2019. Valley Inspired Products. All Rights Reserved.